The Edwardian era coincided with “a steady expansion of British reading habits”, with the number of books published and made available to readers – through the establishment of new public libraries, Workers’ Educational Associations and book clubs – showing remarkable advances from the turn of the century to the mid 1910s. Beyond this trend lay an improvement in family incomes and a rising level of literacy, in addition to vast population growth and increase in life expectancy. The fastidiousness and inequality of Victorian Britain resonated strongly with this new Edwardian society, generating a soar in fiction on social realism and the fantasies of romantic adventure, the spirit of childhood and outdoor life. As the popularity of the book flourished, so did bookplates – decorative printed labels typically pasted onto the front endpaper of books to declare ownership – each individually designed to reflect its owner’s tastes, personality and upward mobility, leading the years between 1901-1914 to be declared the “Golden Age of Bookplates”. Although the use of bookplates began in Germany around 1470, they were not introduced to Great Britain until 1574, the first known British bookplate being that of Sir Nicholas Bacon. From the late 16th century onwards bookplates passed through a variety of recognisable classic designs, the majority of which favoured armorial and heraldic styles bearing a name, coat of arms and motto that related to the owner of the book. But it was the Edwardian era that graced society with a whole new concept: the pictorial bookplate. Despite criticisms by then-scholars that these types of bookplates were “ridiculous”. and their acceptance would not be forthcoming, the demand for pictorial bookplates flourished to such an extent that they became mass-produced for the first time, making it possible for anybody, no matter what their class, to purchase them. The following section wishes to outline five of these most widely prominent designs, highlighting the value of adopting a linguistic perspective to the history of bookplates. Currently, bookplates are only being investigated within the field of provenance, analysed solely from bibliographical and art-historical perspectives. By combining New Literacy Studies with ethnohistoric research, a deeper exploration of the ways in which the semiotic features of word and image convene in bookplates to make meaning can be carried out, while simultaneously affording a better understanding of the ways in which the ‘recognised’ and ‘projected’ identities of owners come together and are expressed through these works of art. This bookplate consists of a stack of books lying on top of one another or resting on a square architectural plinth. In its central space, thus surrounded by books, appears a hanging scroll bearing the owner’s name. 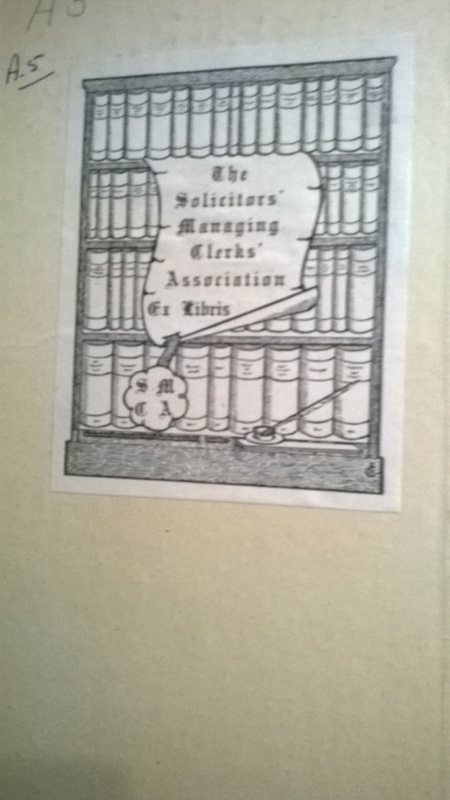 The bookplate below, dated 1903, belonged to The Solicitors’ Managing Clerks’ Association and appeared in The World of Compensation. The shelves of books, coupled with the pen and ink, give off a professional image of a diligent and well-informed business. These bookplates typically exhibit interior views of libraries, or a section of the room in which bookcases appear. They often show an enormous amount of detail and it is not uncommon to see Ancient Roman or Greek figures sat in these scenes reading. 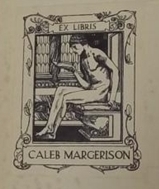 In the subsequent bookplate, from The Evolution of Worlds (1909) in the library of Caleb Margerson, we see just this scene. 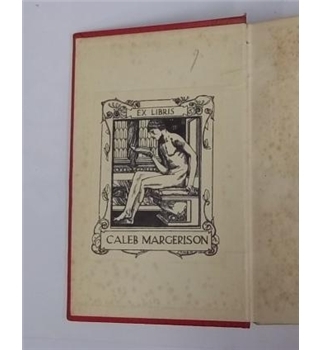 Census records show that Caleb Margerson was a wealthy and renowned soapmaker in Lancashire between 1881-1911. 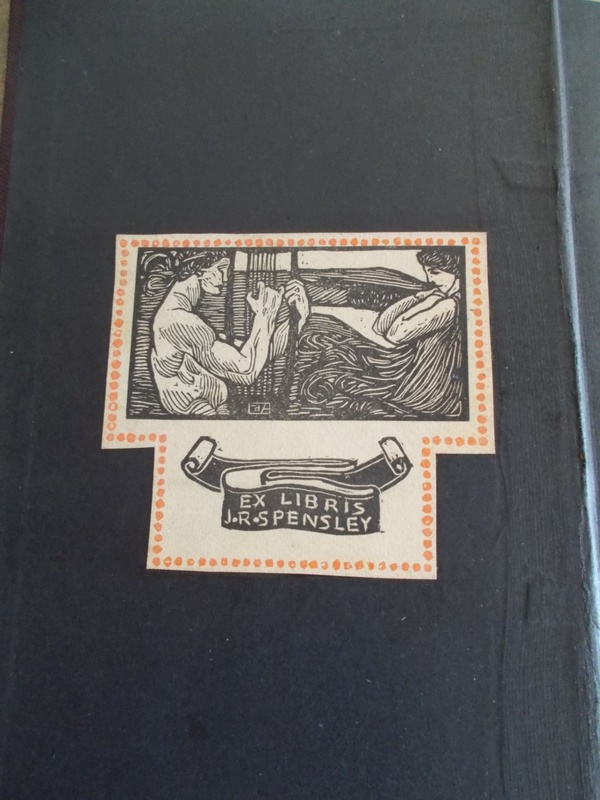 This bookplate was privately commissioned and designed for him by artist Robert Anning Bell. Within this type of bookplate, many subcategories can be found depending on individual owners’ specific requirements. Scenes from one particular fictional or mythological story could be compiled, yet equally so could an elaborate range of characters from different novels. Interestingly, we see a re-occurrence of the Ancient Greek theme in the bookplate below: a reflection of the craving Edwardians had to flee to the past in the midst of an uncertain future. Here, we see a male playing a lyre, while his lover listens amusedly. Ethnohistoric research reveals that the bookplate belonged to Mr James Richardson Spensley – one of the Brits responsible for bringing football to Italy, establishing Genoa F.C. in 1896. The book itself, being The Religion of Plutarch (1902), offers an insight into the Italianate culture in which he was immersed. 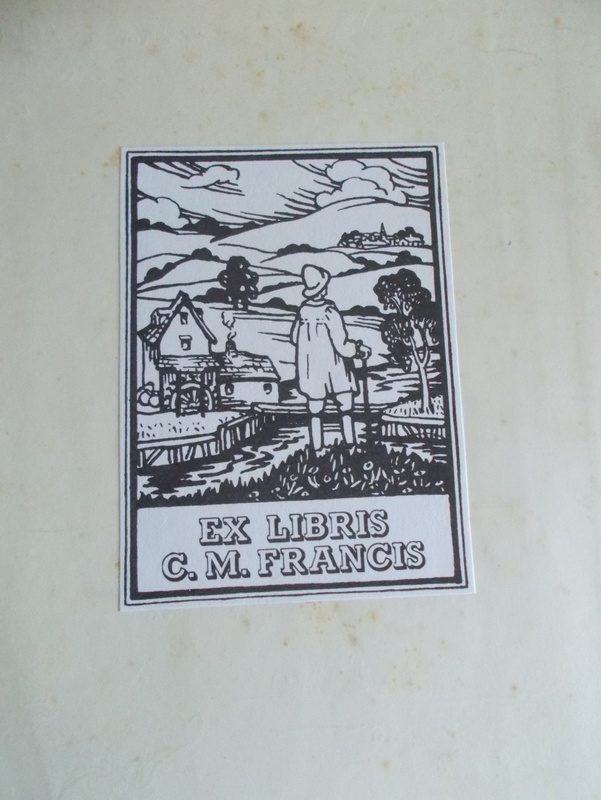 This style of bookplate combines the natural and man-made beauties of the world, often encompassing countryside, historic buildings, churches and castles, according to the owner’s individual taste. As well as reflecting its owner’s own beliefs or background, the quiet allegory of nature in these designs was also seen as a form of moral teaching. In the bookplate featured below, a typical countryside scene of a farmer with a staff overlooking his fields is presented. It comes from a 1911 book, entitled Honey Bee, and accompanying census data shows that its owner, Catherine Mary Francis, hailed from a family of farmers, thus the bookplate can be seen as a symbol of this legacy. The Edwardian era also saw growing concern for animal welfare. With the Animal Defence and Anti-Vivisection Society established in 1903, many book-owners chose to reflect their favour for animal rights through their choice of bookplate design. 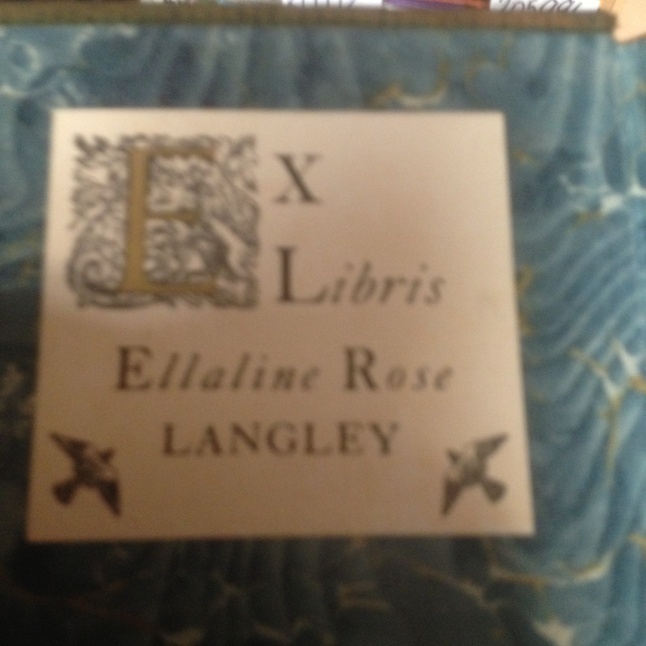 The animal bookplate, however, from Stories from the Faerie Queen (1903) in the library of Ellaline Rose Langley, stands out for its more subtle message. Featuring a large gilt E decorated with floral motifs, this ornate and feminine bookplate also depicts two soaring pigeons at its base. Background research has revealed that before marrying, Ellaline’s maiden name was Pigeon. It is fascinating to see how her heritage is deftly displayed through the familial reference in this personal bookplate. Needless to say, these five examples are just a few of the many delightful bookplates available in Edwardian Britain. Although rebus, portrait and manuscript designs were also vastly favoured, as they are, unfortunately, much harder to come by, their linguistic properties currently remain unexplored. Nowell-Smith, Simon. 1965. Edwardian England 1901-1914. Oxford: Oxford University Press. McKitterick, David.2009. The Cambridge History of the Book in Britain Volume VI 1830-1914. Cambridge: Cambridge University Press. Pearson, David. 1998. Provenance Research in Book History. London: The British Library. Tonald, Eleanor. 2014. And Did Those Hooves – Pan and the Edwardians. Unpublished PhD Thesis. Victoria University of Wellington. This entry was posted in Essays and tagged bookplates, edwardian bookplates, edwardian literature, edwardian readers, reading history, robert anning bell. Bookmark the permalink.